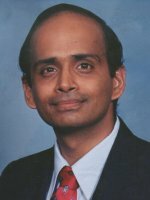 Congratulations to Dr. Ram Devanathan on receiving a 2008 Battelle Community Spirit Award. A noted materials scientist, he earned this important award for his outstanding efforts in organizing 21 blood drives in 5 years at the Pacific Northwest National Laboratory. Blood drives provide premature babies, cancer patients, accident victims, people undergoing surgery and others with the blood and blood products they need to survive. As the coordinator, Devanathan and his team scheduled and advertised the quarterly events, set up appointments, and baked refreshments for the donors. "I wanted to give something back to the community," said Devanathan, "And this opportunity to lead the blood drives opened up right after I joined Battelle in 2003." To keep the project fresh, he will soon hand the reins of the Team Battelle blood drive project over to Paul Hinderliter. After a short vacation, Devanathan will be looking to lead a new Team Battelle project that will help others.